Los Angeles native Mike Stilkey is an internationally recognized artist who has always been attracted to painting and drawing not only on vintage paper, record covers and book pages, but on the books themselves. 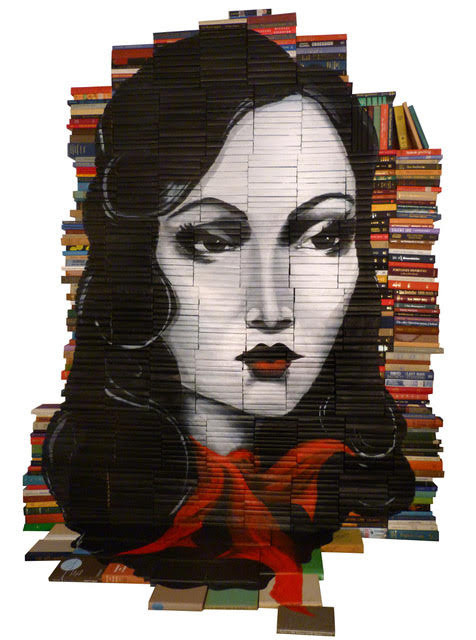 He is best known for creating small and large-scale installations that use discarded books as their canvas. Using a mix of ink, colored pencil, paint and lacquer, Stilkey depicts a melancholic and at times a whimsical cast of characters inhabiting ambiguous spaces and narratives of fantasy and fairy tales. A lingering sense of loss and longing hints at emotional depth and draws the viewer into their introspective thrall with a mixture of capricious poetry, wit, and mystery. His work is reminiscent of Weimar-era German expressionism and his style has been described by some as capturing features of artists ranging from Edward Gorey to Egon Schiele. Stilkey has created numerous large-scale installations, at the World Economic Forum Annual Meeting in Davos, Switzerland, and in Turin, Italy; Bern, Switzerland; Bordeaux, France; Manila, Philippines; and Hong Kong and Beijing, China. His work has been exhibited throughout the United States as well as internationally, at galleries and museums such as the Bristol City Museum in the UK; Rice University Gallery, Houston, TX; Bakersfield Museum of Art in Bakersfield, CA; Mesa Contemporary Arts Museum, Mesa, AZ; San Jose Institute of Contemporary Art, San Jose, CA; the Arne Nixon Center at California State University, Fresno; Kinsey/DesForges Gallery in Culver City, CA; David B. Smith Gallery in Denver, CO, and Gilman Contemporary Gallery, Ketchum, ID.